November 10, 2018, 6:04 PM · If you are curious about the best contemporary instrument and bow makers of the current century, here is a good starting point: look below at the list of 2018 Violin Society of America Competition winners, just named last week at the Violin Society of America's annual convention in Cleveland. Their instruments were chosen for outstanding workmanship and tone from 350 violin, viola, cello and basses and 100 bows that were submitted by luthiers and ateliers from around the world for the VSA's 23th International Competition. Here are the winning luthiers and bowmakers in the violin and viola categories, chosen from hundreds of entries. Wherever possible, I've provided the link in case you wish to learn more about any of these makers. For winners in other categories, bass and quartet, please see this page. 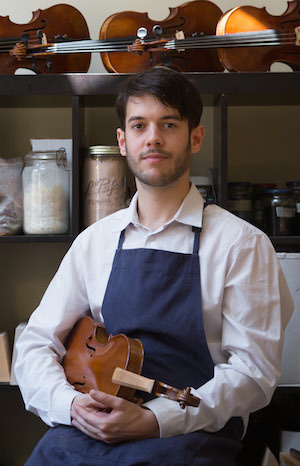 Violin maker David Leonard Wiedmer. Judges in the violin category included Chris Germain, Feng Jiang, Primo Pistoni for worksmanship; Cristian Fatu, Nathan Giem and Ilya Kaler for tone. Here is a list of all the judges. November 11, 2018 at 01:49 AM · Laurie, wish you could have made it out for this one. Entries from 27 countries, according to the competition chairman. My mind is still reeling, from all the modern-legend makers who were present, to the old instrument exhibit, to the quality of the lectures, to learning how to communicate through the latest hand-held language translation devices. November 12, 2018 at 12:37 AM · The results for Double Bass please? November 12, 2018 at 03:51 AM · Here are the bass results, and you can find all the results on the VSA website by clicking here. November 13, 2018 at 01:46 PM · Thanks, it’s really interesting that some of the same names as the 2016 VSA awards with different results. Some silver medal both in 2016/2018 while some previous certificates of merit winners won gold medals and vice versa. I imagine the margin of difference at this level of violin making is very close. 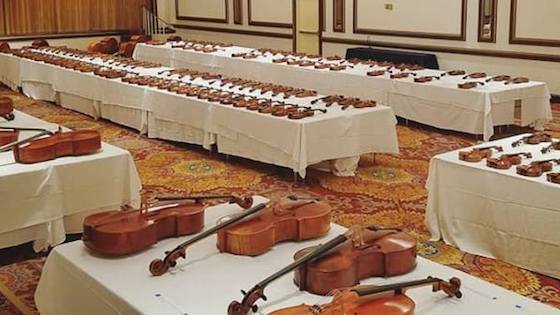 I’vm curious... is it because of different individual judges, variations in violins the same maker, or having different competitors that explains the varying results?